I really feel old when i realize that something I thought happened recently happened 10 years ago. This is one of them. 10 years ago it was getting close to the Christmas break. I had finished high school six month earlier to work at a photo development lab to make some money. Previously I had made a website together with my dad for a couple of years but now I wanted my own domain so I could have my own website and email without having to use hotmail or any of the other free email services of that day. In high school I had acquired the peculiar nickname Gelle among my friends and since it was short and I couldn’t think of anything else I picked that. Not that I really like the word – it looks and sound a bit like gele but I got it now, it’s fairly unique and it’s my username on most websites if I can get it. 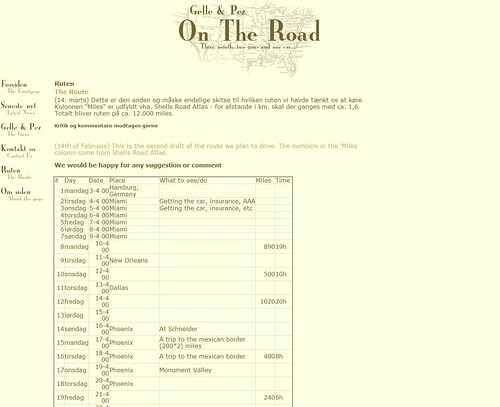 The first thing I was really using the site for (except for a page of quotes about beers) was to write about the preparations before, and keep friends and family update during, a trip to USA for 3 month in 2000. I have lost the actual updates I wrote during the trip and only the shell of the site is left. The first front page from 1999 is again lost in history. 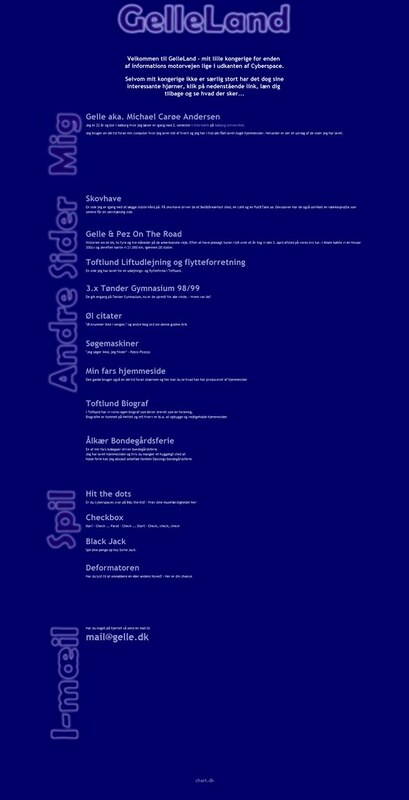 After I came back from US in summer of 2000 I started university in Aalborg and this became my for next couple of years. A collection of links to small websites I’d made for myself and friends. 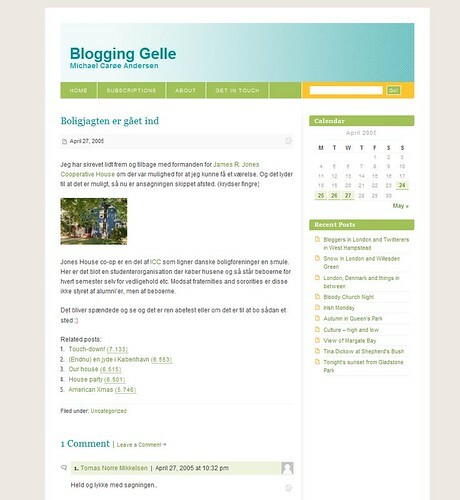 In 2005 I was heading to US again, this time for an internship in Ann Arbor so I created the blog you are reading in April 2005 and started blogging in Danish about my upcoming trip. Blogging became a habit with about a post a week which I try to keep up. About a year and a half later I was back in Denmark and switched over to blogging in English. The design of the blog has changed slightly every now while the tone of the blog has stayed more or less the same throughout the past 4 and a half years, I think. I have blogged a lot about place I have gone, things I have done and very little about my company, thoughts and reflections. And I think it will stay that way. Who knows what will happen in the next decade but for some reason I doubt we’ll still be using domain names and URLs to find each other. If we do you’ll maybe find a strange 40-year-old(!) behind gelle.dk rambling about and taking pictures of whatever he comes across in his days. This entry was posted in Blogging by michael. Bookmark the permalink.